Let’s get two things straight about chocolate: Oompa-loompas do not man the machines in a chocolate factory. And white chocolate, according to Master Chocolatier and Pastry Chef Jean-Marie Auboine, is NOT chocolate. “Technically white chocolate is just cocoa butter, powered milk and sugar. The real chocolate needs to have cocoa nut or cocoa liquor—that is the milk chocolate and the dark chocolate. The world renowned French confectioner was formerly a pastry chef at the famous Fontainebleau restaurant in Miami Beach before coming to Las Vegas to work as a pastry chef at the Bellagio. 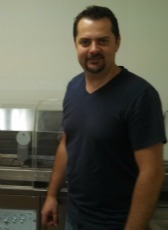 Today he is the proud distributor of his own brand of chocolate and candies that he produces along with six employees at a 4500 square foot factory in a semi-industrial section of Las Vegas. 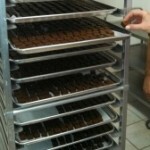 Auboine makes custom chocolates in vast quantities for large hotels here in Las Vegas and across the country. He ships boxes of 200 to 250 chocolates daily via air-conditioned trucks to be used for VIP events and as hotel amenities; milk chocolates, dark chocolates, bonbons, nougats, marshmallow bars, almond and peanut chocolates, caramels, signature luxury chocolates and more. A personal favorite is the Lion Bar: a masterpiece of Rice Krispies Treats blended with creamy caramel and milk chocolate.